Indonesia is the world's fourth most populous nation. 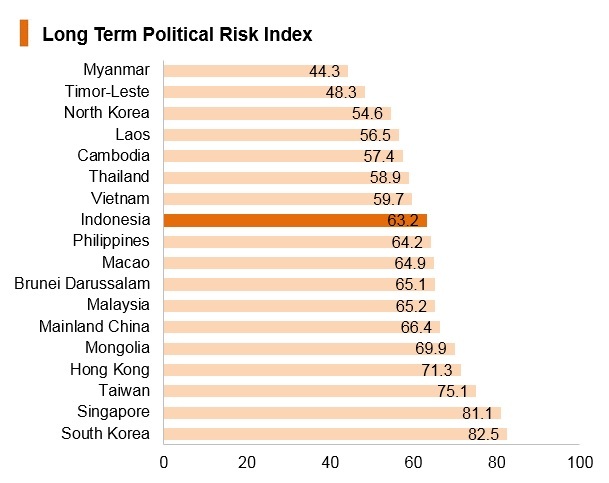 It has maintained political stability and is one of Asia Pacific's most vibrant economies, emerging as a buoyant middle-income country. 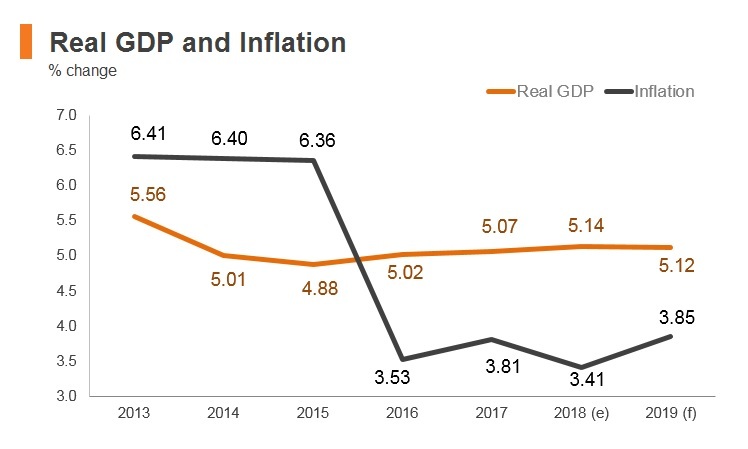 The country's economic planning follows a 20-year development plan, spanning between 2005 and 2025. It is segmented into five-year, medium-term plans, called the Rencana Pembangunan Jangka Menengah Nasional (RPJMN), each with different development priorities. The current medium-term development plan – the third phase of the long-term plan – runs from 2015 to 2020. It focuses on, among other things, infrastructure development and social assistance programmes related to education and healthcare. To strengthen the country's investment climate and economic growth, the government continues to announce policy reforms intended to cut red tape. Regional and local elections were held on June 27, 2018 to elect 17 governors, 39 mayors and 115 regents across the country. The elections included gubernatorial elections for Indonesia's four most populous provinces: West Java, East Java, Central Java and North Sumatra. A major earthquake and tsunami killed more than 2,000 people on the island of Sulawesi, around the city of Palu. The eruption of Anak Krakatau caused another tsunami, killing over 420 people and displacing an additional 40,000. Indonesia has been a member of the World Trade Organisation (WTO) since January 1, 1995. 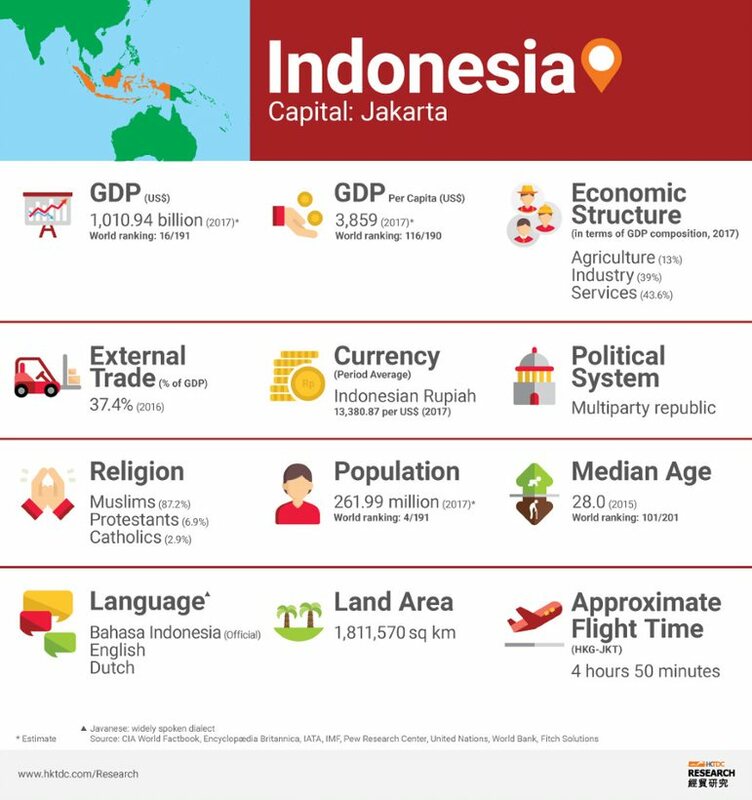 Indonesia is a member of the Association of South East Asian Nations (ASEAN) and a signatory to the ASEAN Free Trade Agreement (FTA), which aims to reduce tariff and non-tariff barriers to trade between member states. ASEAN has also negotiated an FTZs with Australia, New Zealand, mainland China, India, South Korea and Japan. The latter has a separate bilateral FTA with Indonesia. 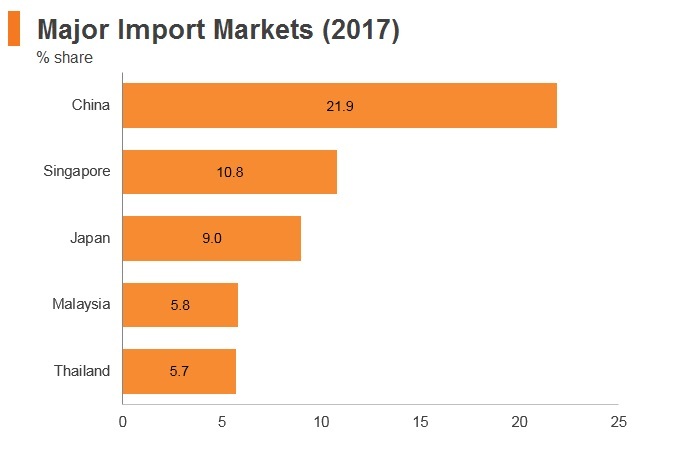 While Indonesia's membership in numerous regional and economic bloc and FTA arrangements has resulted in the country having a very low applied average tariff rate of 2.3% (which is the sixth lowest in East and South East Asia), there are numerous other barriers to trading with the country. There is significant trade bureaucracy (time and costs) involved for supply chains when exporting out of and importing into Indonesia. 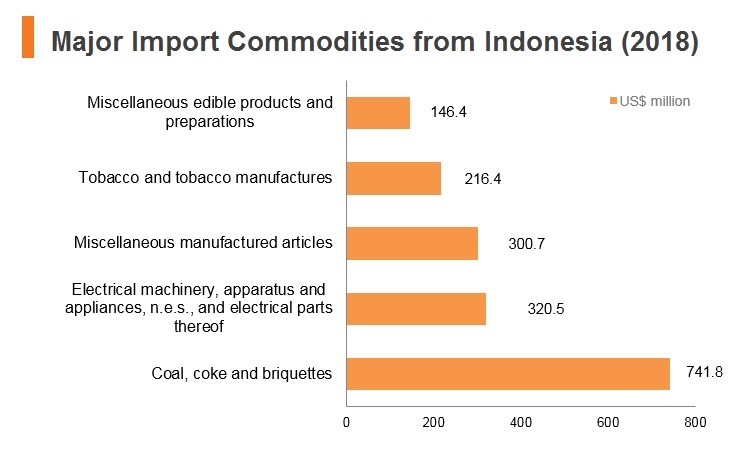 Import tariffs are mostly imposed on an ad valorem basis in Indonesia. The import duty ranges between 0% and 20% for most items, except for certain items such as alcohol, tobacco and cars, which face duties of up to 150%. Value-added tax (VAT) is applicable on deliveries (sales) of goods and services within Indonesia at a rate of 10%. VAT on exported goods is zero-rated, while imported goods are subject to VAT at a rate of 10%. The average applied most favoured nation tariff is 7.8% for non-agricultural products and 8.4% for agricultural imports. More than 85% of tariff rates are currently in the range of 0-10%. In line with long-standing sectoral support, the highest tariffs apply mainly to motor vehicles. 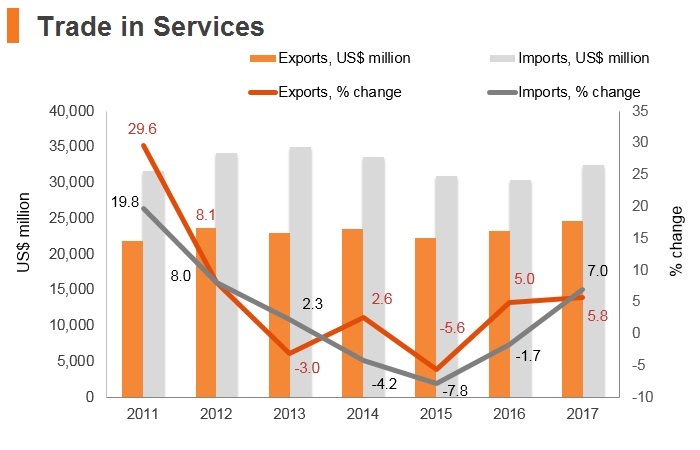 In January 2017, Indonesia relaxed the ban on unprocessed mineral exports in an attempt to boost the economy and ease budgetary pressures. 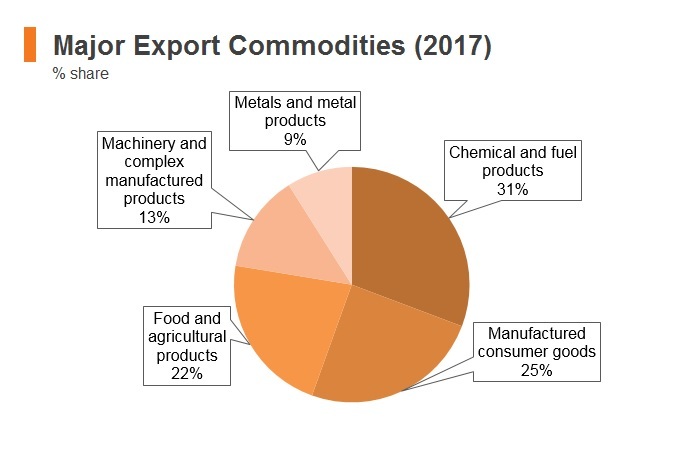 The ban was implemented in 2014 to promote the domestic mineral processing industry and encourage exports of higher value-added mineral products. 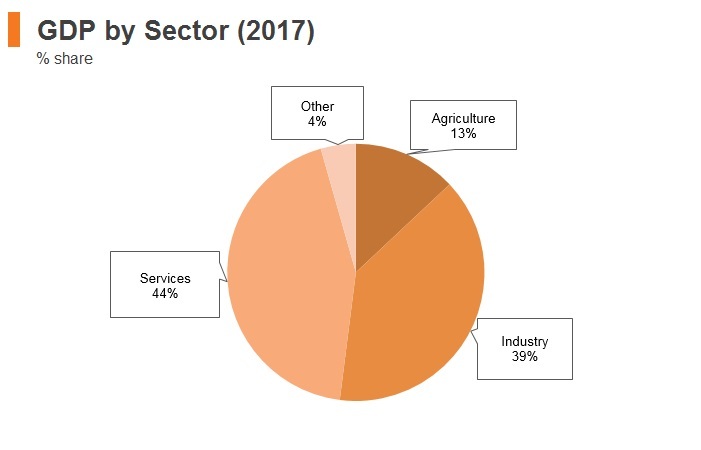 In June 2018, the Indonesian Ministry of Agriculture introduced a subsidy on hybrid corn seeds, which is expected to increase corn production by 40.5% until 2025. To achieve this goal, it will distribute 40% of the total demand for hybrid corn seeds, which can negatively affect imports of hybrid corn seeds into Indonesia. 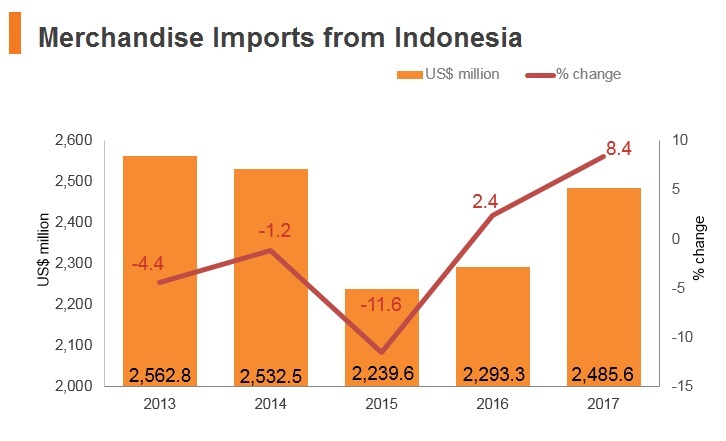 In August 2018, the Indonesian government announced an increase in tariffs on over 500 consumer goods to 7.5% in order to reduce imports and improve the current account. Since the announcement, the planned number of goods affected by the tariffs has increased from 500 to 900 and some tariffs have increased to 10%. 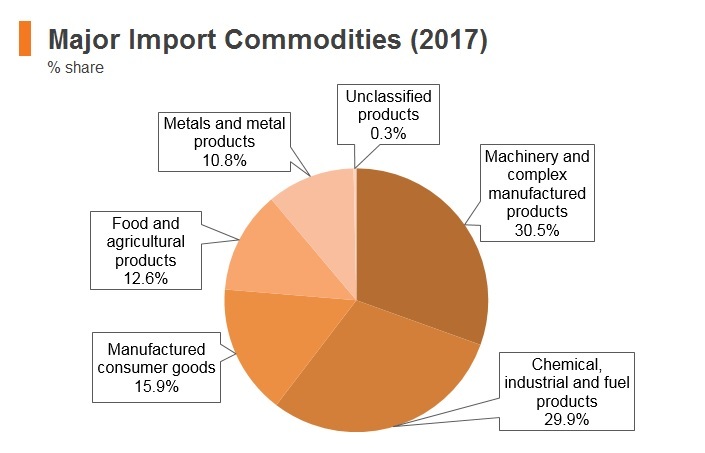 Affected products are primarily consumer goods, as opposed to raw materials, as imported consumer goods can easily be substituted for domestic ones. The Indonesia-European Free Trade Association (EFTA) FTA was signed by all parties (Indonesia and EFTA member states Iceland, Norway, Switzerland and Liechtenstein) on December 16, 2018. No date has yet been confirmed for when the agreement will come into force. In April 2018, the African Export-Import Bank and the Indonesia Export-Import Bank entered into an agreement to commit up to USD100.0 million to support businesses and trade activities between Indonesia and African countries. Indonesia is set to become part of one of the largest Asian/Southern Hemisphere FTAs: the Regional Comprehensive Economic Partnership (RCEP). Major negotiations for the eventual conclusion of the RCEP occurred in April 2018. Indonesia is a member of WTO (effective date: January 1995). ASEAN Free Trade Area (AFTA – effective date: January 1993): AFTA reduces tariff and non-tariff barriers between member states; in particular, Indonesia's trade with Malaysia and Singapore is significantly boosted. The 10 members of the ASEAN FTA are: Brunei, Indonesia, Malaysia, Philippines, Singapore, Vietnam, Laos, Myanmar, Indonesia and Cambodia. ASEAN-mainland China FTA and Economic Integration Agreement (effective date: January 2005 for goods and July 2007 for services): The FTA is a comprehensive economic co-operation between ASEAN member states and mainland China. The goal of the agreement is to eliminate tariffs and address behind-the-border barriers that impede the flow of goods and services. Japan-Indonesia FTA and Economic Integration Agreement (effective date: July 2008): The FTA is aimed at facilitating, promoting and liberalising trade in goods and services between the parties. 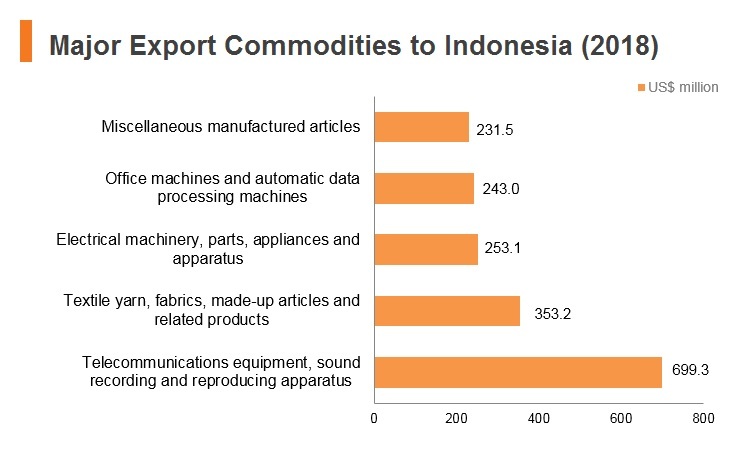 Japan is Indonesia's third largest export and import partner. This FTA provides a strong boost to trade ties and helps the country balance its reliance on mainland China. 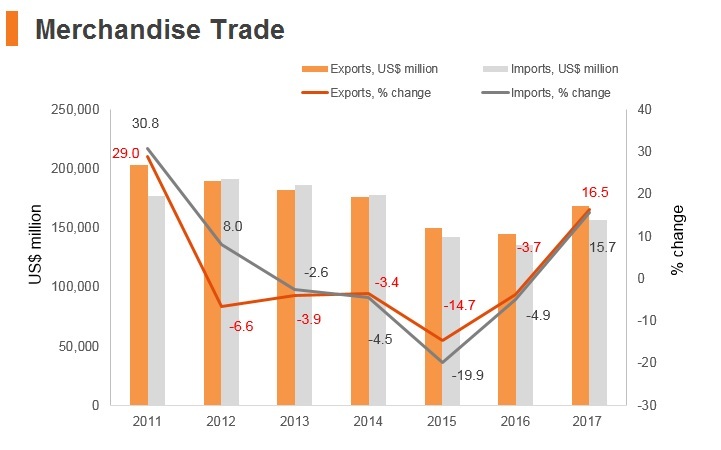 Pakistan-Indonesia FTA (effective date: September 2013): The FTA allows Indonesia to offer market access to Pakistan for 216 products at preferential rates, including fresh fruits, cotton yarn, cotton fabrics, ready-made garments, sports items and leather goods. Pakistan's offer list to Indonesia includes a total of 287 tariff lines at preferential tariffs; the country has also agreed to give the same treatment to Indonesian palm oil products as provided to Malaysia under the Pakistan-Malaysia FTA. 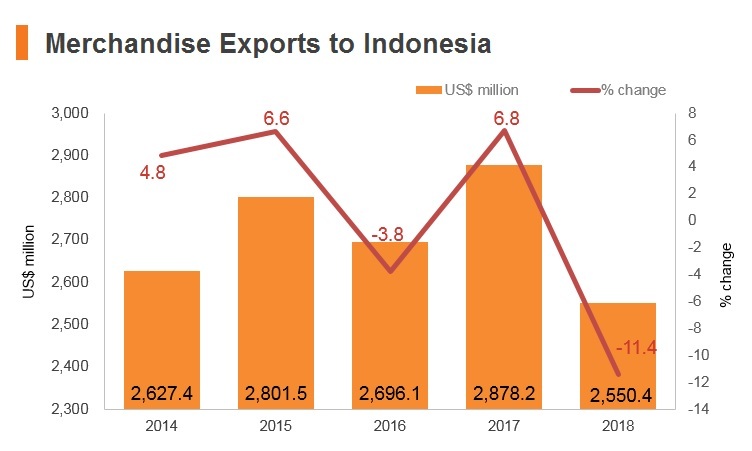 In addition, Indonesia has cancelled its tariffs on imports from Pakistan of the regionally important citrus fruit, kinnow (a type of mandarin), creating a level playing field in the Indonesian market for this product, which is produced in both Pakistan and India. ASEAN-Republic of Korea FTA and Economic Integration Agreement (effective date: July 2007): The FTA allows 90% of the products being traded between ASEAN and South Korea to enjoy duty-free treatment. Preferential Tariff Arrangement Group of Eight Developing Countries (effective date: August 2011): The agreement involves countries which are members of the D-8 Organisation for Economic Co-operation, namely Indonesia, Malaysia, Bangladesh, Pakistan, Iran, Egypt, Turkey and Nigeria. The objective of the member countries is to reach a preferential trade agreement to enhance intra-trade and to reach an agreement on administrative assistance in customs matters to support the preferential trade agreement. ASEAN-India FTA and Economic Integration Agreement (effective date: January 2010): The agreement involves the liberalisation of tariffs on over 90% of products traded between the two regions, including the so-called 'special products', such as palm oil (crude and refined), coffee, black tea and pepper. ASEAN-Australia-New Zealand FTA and Economic Integration Agreement (effective date: January 2010): The agreement aims to eliminate tariffs on 99% of exports to key ASEAN markets by 2020. ASEAN-Japan FTA (effective date: December 2008): The agreement includes commitments on trade, investment and official development assistance. ASEAN-Hong Kong FTA (signed in November 2017 and expected to enter into force in early 2019 at the earliest): The deal aims to cover all aspects of trade in goods, such as tariffs, rules of origin, non-tariff measures, customs procedures and trade facilitation, trade remedies, technical barriers to trade and sanitary and phytosanitary measures. 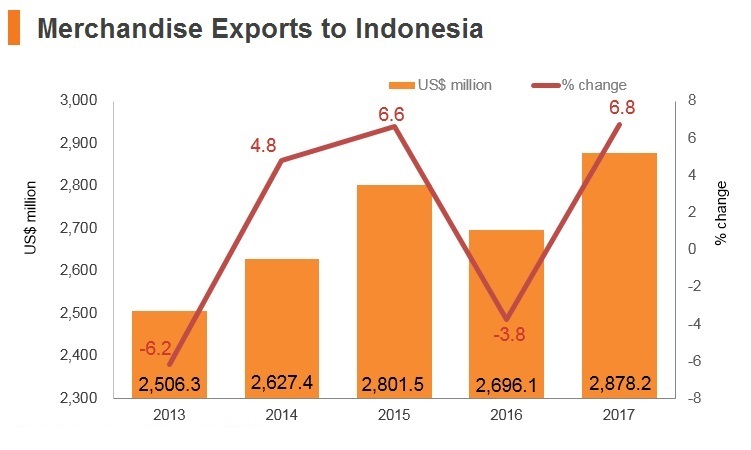 Indonesia-Chile FTA: The FTA will lead to the gradual removal by the Indonesian government of tariffs on 9,308 products with a further 590 products seeing tariffs reduced by either 25% or 50% on the current rate. 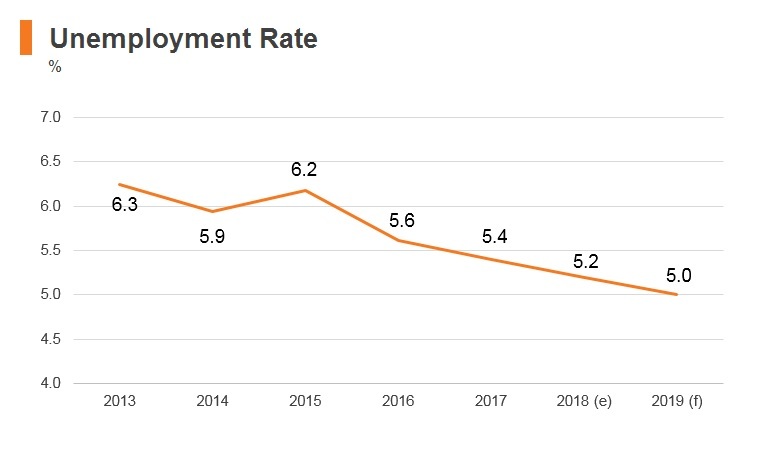 At the same time, Chile will remove tariffs on 7,660 items, 78% of them immediately after the trade deal enters into force, 2.1% at the beginning of its fourth year and 9.2% in the sixth year. EFTA FTA: The FTA will help Indonesia penetrate the European market and increase investment flows from EFTA member states Iceland, Norway, Switzerland and Liechtenstein into the South East Asia country. The agreement was signed on December 16, 2018, with no date yet confirmed for when the agreement will come into force. The Trade Preferential System of the Organization of the Islamic Conference (TPS-OIC): The agreement would see to the promotion of trade between member states by including most-favoured nation principles, harmonising policy on rules of origin, exchanging trade preferences among member states, promoting equal treatment of member states and special treatment for least developed member states, and providing for regional economic bodies made up of OIC nations to participate as a block. The agreement will cover all commodity groups. The OIC comprises 57 members, making a full realisation of such an agreement highly impactful, encompassing approximately 1.8 billion people. Although the Framework Agreement, the Protocol on Preferential Tariff Scheme (PRETAS) and the Rules of Origin have all been agreed on, a minimum of 10 members are required to update and submit their concessions list for the agreements to come into effect. As of January 2019, only seven nations have done so. India-Indonesia Comprehensive Economic Co-operation Arrangement: The arrangement seeks to expand and develop bilateral relations and co-operation in the fields of trade, industry, investment and other economic fields. Indonesia-Australia Comprehensive Economic Partnership Agreement: The agreement presents potential for increased trade in services with Indonesia. 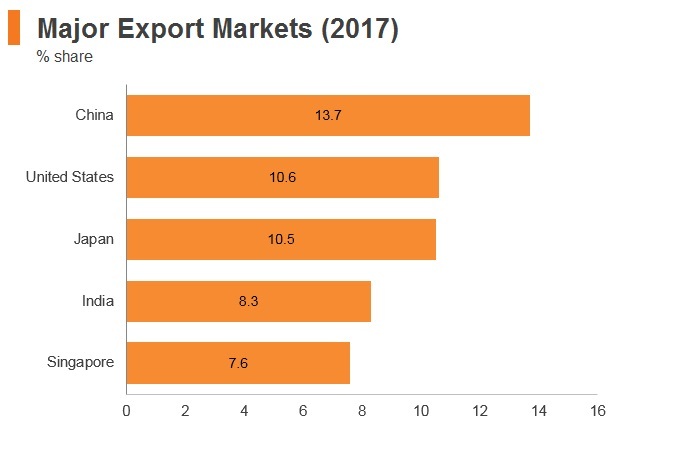 Given the nature of the two economies, services trade is likely to comprise a larger proportion of Australia's total exports than with other countries. Australia's ratification of the CPTPP has partially delayed the signing of the agreement. 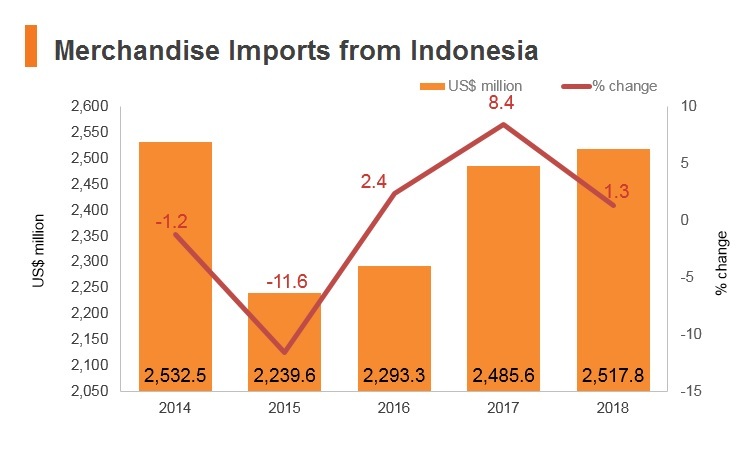 Indonesia-Turkey FTA: The FTA will seek to remove factors that hinder trade with Turkey, including import and export duties of some commodities. RCEP: RCEP is a proposed FTA between the 10 member states of ASEAN (Brunei, Cambodia, Indonesia, Laos, Malaysia, Myanmar, Philippines, Singapore, Thailand and Vietnam) and the six states with which ASEAN has existing FTAs (Australia, mainland China, India, Japan, South Korea and New Zealand). RCEP will cover trade in goods, trade in services, investment, economic and technical co-operation, intellectual property, competition, dispute settlement and other issues. Government bodies are responsible for foreign direct investment (FDI) promotion, licensing and regulations. The Investment Co-ordination Board (BKPM) serves as an investment promotion agency, a regulatory body, and the agency in charge of approving planned investments in Indonesia. Foreigners cannot effectively own land in Indonesia in urban and rural settings. They can obtain formal rights to use the land for a certain period for purposes such as mineral expropriation, agriculture, building and commercial purposes, by forming a legal entity (company) incorporated according to Indonesian law and domiciled in Indonesia. Businesses can purchase apartments and office space in Indonesia valid for a period of time, if various stringent stipulations are complied with. It still remains a difficult and time onerous process. In order to conduct business in Indonesia, foreign investors must be incorporated as a foreign-owned limited liability company in Indonesia (PMA). Investors are also required to participate in the Workers Social Security Programme or BPJS. 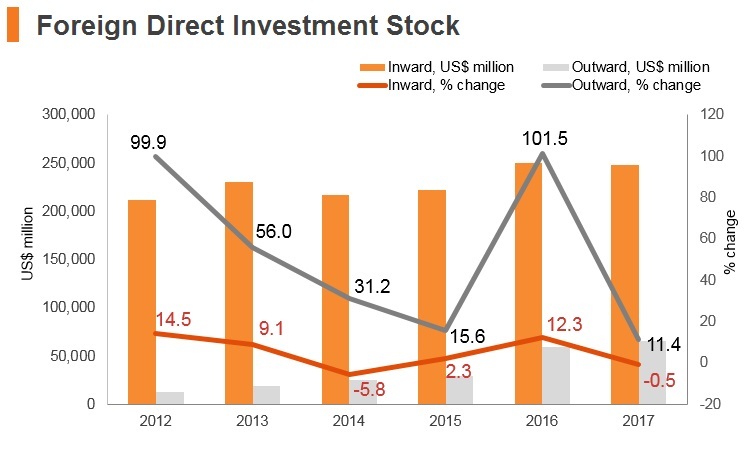 Foreign investors are generally prohibited from investing in micro, small and medium enterprises in Indonesia, although the 2016 Negative Investment List opened some opportunities for partnerships in farming, catalogue and online retail. The Indonesian government is attempting to ensure that it maintains a stake in the exploitation of the country's national resources by maintaining that foreign-owned mining companies must gradually divest 51% of its shares to Indonesian interests over 10 years, with the price of divested shares determined based on fair market value and not taking into account existing reserves. Under new proposed oil and gas laws, the state's national oil company will have right of first refusal over any new oil and gas contracts in Indonesia. The Indonesian government expects foreign investors to contribute to the training and development of Indonesian nationals, allowing the transfer of skills and technology required for their effective participation in the management of foreign companies. As a general rule, a company can hire foreigners only for positions that the government has deemed open to non-Indonesians. Employers must have training programmes aimed at replacing foreign workers with Indonesians. High regulatory uncertainty exists in the mining, oil and gas, and construction industries. 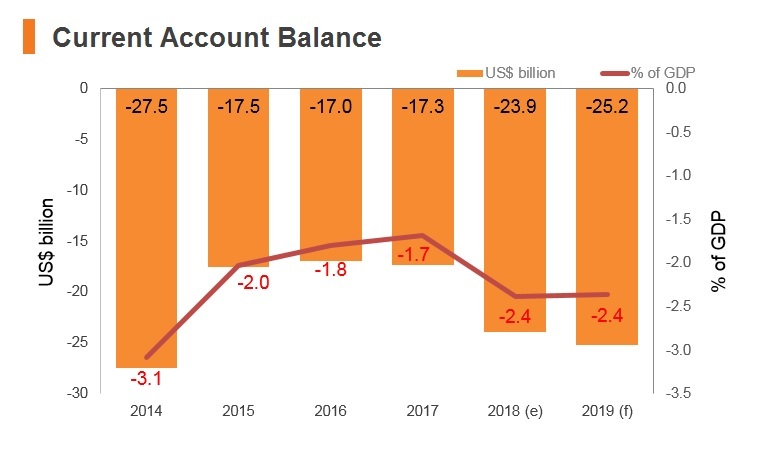 Indonesia regularly issues and reverses various policies on export bans, taxes and licensing requirements which create significant investor uncertainty in these sectors. The government has introduced a new incentive for investments of between IDR100.0 billion and IDR500.0 billion in eligible sectors, namely a 50% corporate income tax cut for a five-year period. A 57% excise tax on e-cigarettes was effective from July 1, 2018. Inline with Indonesia's commitment to implement Base Erosion and Profit Shifting Action 13, Indonesian parent entities or Indonesian subsidiaries of multinational enterprises which meet certain conditions are required to prepare and file a Country-by-Country Report to the DGT starting with the 2016 tax year. Withholding Tax (dividends) Dividends paid domestically to a resident :15%. Dividends remitted to overseas shareholders are subject to a final 20% withholding tax, unless a tax treaty provides a lower rate. Withholding Tax (interest, royalities) Residents are subject to a creditable withholding tax of 15% with any balance being payable or refundable, while non-residents are subject to a final withholding tax of 20%. Withholding Tax (branch profits tax) 20%. This rate may be reduced under a double tax treaty. Branch profit tax applies regardless of whether the income is remitted to the head office. Value Added Tax 10% standard rate. VAT on export of goods is zero-rated while the import of goods is subject to VAT at a rate of 10%. A company can hire foreigners only for positions which the government has deemed open to non-Indonesians. Employers must have training programmes aimed at replacing foreign workers with Indonesians. The foreign worker must meet education, work experience and Indonesian language requirements and commit to transfer knowledge to an Indonesian counterpart. Staying in Indonesia for work purposes for a long period (or anything over five weeks) requires the approval of the Immigration Office in Indonesia. Foreign workers must have the necessary visa and work and stay permits, all of which can be applied for by the sponsor or counterpart in Indonesia at the Immigration Office in Indonesia. Foreigners can only be issued with limited or temporary resident visas for a maximum period of 12 months, with the possibility of extension; although, this is again subject to approval from the Immigration Office. The process of obtaining a visa and work permit for foreigners in Indonesia is lengthy, taking an average of three months. It is also a bureaucratically complex process. The temporary resident visa can only be obtained if the applicant has a sponsor or counterpart in Indonesia to help them obtain the visa by applying to the Immigration Office. Given that Indonesia has a significant tourism industry, there are many countries (such as those in the European Union and those party to the Asia-Pacific Economic Co-operation Agreement) whose citizens can obtain visas on arrival in order to enter Indonesia for periods of up to 30-60 days. 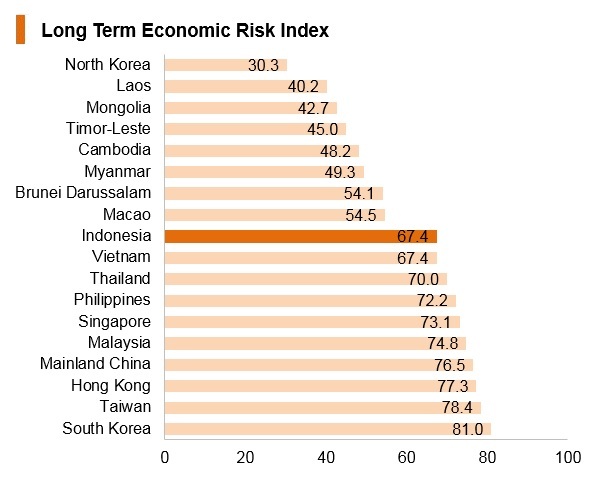 This means that Indonesia is an easy country to enter for business trip purposes. 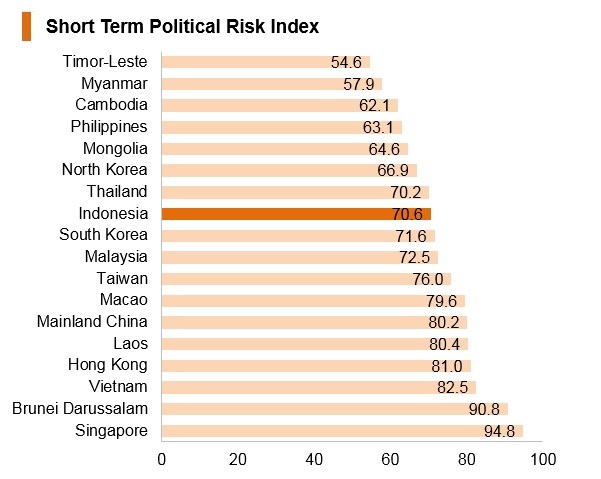 Indonesia's short-term economic risk is constrained by an inefficient tax system and reliance on resource revenue, while its long-term economic risk is dragged down by the poor quality of government expenditure and the high volatility of its currency. 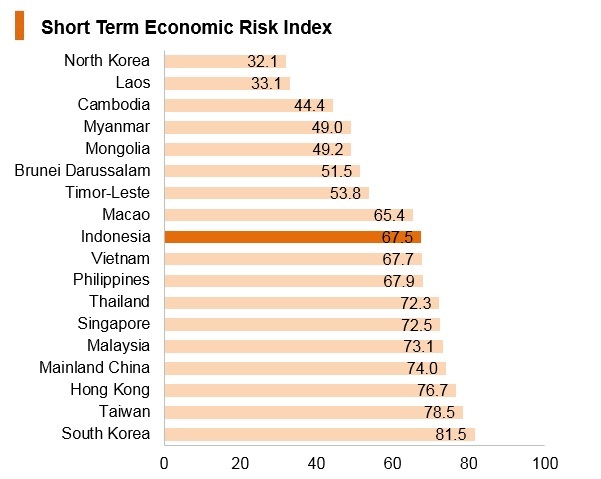 There are various opportunities for investment in Indonesia, which is South East Asia's largest economy. 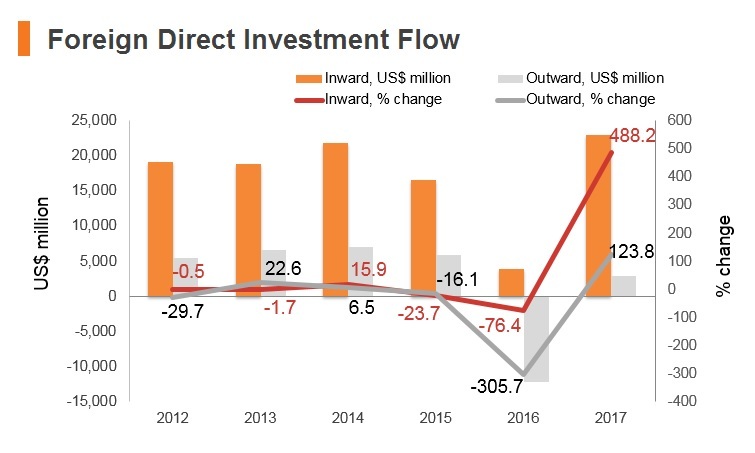 The manufacturing, ICT, financial services, oil and gas, and infrastructure sectors all represent attractive options for FDI, while portfolio investment, through increasingly sophisticated local financial markets, is a key source of capital inflows. Furthermore, businesses in Indonesia are able to make use of the country's strategic location on vital global shipping lanes which paired with the various port projects happening in Indonesia bodes well for the future. Indonesia has a Double Taxation Agreement with Hong Kong that entered into force in March 2012. Hong Kong has an Air Service Agreement with Indonesia that entered into force on June 27, 1997. Visa-free access valid for 30 days.